The messy legacy of the U.S. Civil War has lessons for the current tensions in Northeast Asia. On Wednesday, the United Nations Security Council held an open debate on the theme of “war, its lesson, and the search for a permanent peace.” Under-Secretary General for Political Affairs Jeffrey Feltman, addressing the Security Council, laid out the core of the problem: “As we have seen repeatedly, fighting that ends without reconciliation – especially fighting inside States – is fighting that can, and often does, resume.” In the concept paper for the debate, Prince Zeid Ra’ad Zeid Al-Hussein of Jordan wrote that the UN could play a role in “forging a deeper reconciliation among ex-combatants … based on an agreed or shared narrative, a shared memory, of a troubled past.” A common interpretation of history, Zeid believes, helps smooth tensions between former enemies. To those following the tensions between Japan and China (as well as South Korea), the implications are obvious. As my colleague Ankit wrote, the UN debate became a stage for China, South Korea, and North Korea to criticize Japan’s handling of history. While the fighting between these nations ended almost 70 years ago, the process of reconciliation remains incomplete. The “deeper reconciliation” Zeid described, one based on “a shared memory of a troubled past,” has not yet emerged. China and South Korea do have a “shared memory,” as shown by their comments during the UN debate. The problem, in their eyes, is that Japan “remembers” thing differently. When calling on Japan to “face up to history” or “admit mistakes,” as Foreign Ministry Spokesperson Hua Chunying did this week, what they really mean is that Japan should accept without reservation China and South Korea’s version of history. Here’s the problem with that approach: it’s inevitable that each country will view its past from a more sympathetic (though not necessarily approving) perspective. Generally, each country acknowledges (more or less) that mistakes were made, but no one else understands better how those mistakes happened — the mitigating factors that humanize the decision-makers. For example, Chinese citizens, in general, have a much rosier idea of Mao Zedong’s rule than non-Chinese; they know he made mistakes but will often claim that Mao did the best he could with the historical circumstances he faced. The current tensions in Northeast Asia have another analogue: the conflicted legacy of the U.S. Civil War. As in the Northeast Asia dispute, the major issue is how to appropriately remember the war — especially the Confederates, who fought on behalf of slave-owning states. For example, is it appropriate for Richmond, Virginia, the former capital of the Confederacy, to have a statue of famed Confederate general Robert E. Lee in the heart of the city; for high schools in the South to be named after Lee and other Confederate generals, or even after the Jefferson Davis, the President of the Confederacy, who was arrested (but never tried) for treason? And the ultimate symbolic issue, the subject of a televised debate on Newshour a few years ago — is it acceptable for Southerners (who may or may not have had ancestors fighting in the war) to fly the Confederate flag? To many, the answer is obviously no — the Confederacy stands for slavery and all the horrors that went along with it. It symbolizes not only the oppression of an entire race, but the treason of splitting the country and provoking civil war. To fly such a flag is to intentionally celebrate those who caused untold pain and suffering to hundreds of thousands of Africans and African Americans. To many others, though, the answer is just as obviously yes — while slavery was a terrible mistake, the Confederate soldiers were simply fighting to defend their homeland and deserve to be honored for their sacrifice. Under this line of thinking, the Confederate flag can be divested of its ties to slavery and simply honored as a symbol of Southern culture and heritage. 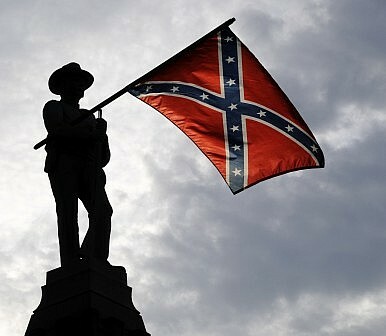 Flying the flag has nothing to do with slavery; it symbolizes Southern pride. In a similar way, some Japanese would argue that Yasukuni can be divested of its ties to war criminals and Japanese imperialism. In both cases, the problem is not so much a denial of history (although extremists in both Japan and the American South have fringe theories alleviating their countrymen of all blame) but a unique interpretation of history by the average person that allows him or her to reject the mistakes of the past without rejecting national or regional pride. It’s easy to frown upon this as Orwellian “doublethink,” but it’s common to all nations, races, and peoples. Judging it in others is easy; rooting it out in ourselves is another matter. For those who shake their heads at how a 70-year old conflict is still riling up Northeast Asia, look at the U.S. 150 years later, and how it still hasn’t sorted out the legacy of the nation’s bloodiest war. Reconciliation doesn’t happen naturally with the passage of time. The shared memories and understandings that lead to reconciliation have to be nurtured by all sides of the conflict, and that takes both time and dedicated effort. “Leaders need to set the example, not just in ceasing war-time rhetoric and ending the intentional promotion of grievances, but also by deeds of genuine cooperation and honest examinations of their own roles in conflict,” Feltman said at the UN debate. This clearly lays the burden of reconciliation on both sides. Not only do past aggressors need to honestly examine their roles in the conflict, but past victims must end the practice of parading their grievances. It’s tough to say which is more difficult, owning up to historical wrongs or letting them go. But both are equally necessary for the sort of reconciliation Northeast Asia needs. That absolutely doesn’t mean that African Americans should embrace the Confederate legacy, or that Chinese and Koreans should accept Japanese politicians visiting Yasukuni. It does mean, though, that accusations and finger-pointing about past wrongs are not going to lead to present reconciliation. Indulging in such tactics doesn’t provide moral high ground; it shows an unwillingness to actually make things better. Instead, solving the problem will take an honest conversation, not about history per se but about historical interpretations, and acknowledging of their power to wound even decades later. Right now, it’s impossible to imagine that conversation happening on an official diplomatic level, but it can just as easily take place elsewhere — in academia, or even in the comments section of articles like this one. A turn toward military normalization threatens Japan position as a peaceful international leader.